Ruby-Marie (Lockridge) Breeding Johnson, age 88, of Franklin, NC, passed away on Wednesday, September 5, 2018 at Kindred Hospital in Melbourne, FL. Ruby-Marie was born on February 5, 1930 in Washington, DC, daughter of the late Robert W. and Marian (Eberle) Lockridge. Ruby-Marie was the firstborn of six children to Colonel Robert and Marian Lockridge. Her childhood involved much travel as her father was stationed in various places around the United States. Ruby’s sisters tell us there were times when she was like a second mother to her younger siblings. She grew up, inspired by her mother and grandmother, Ruby Nevada, and had a love for travel and art! Ruby-Marie graduated high school from Alamo Heights in San Antonio Texas. She then studied at Corcoran Art Institute in Washington DC. After completing her degree, Ruby-Marie was offered a job to be illustrator for the Washington Post at age 18. It was at that time her father, Colonel Robert W. Lockridge, was being transferred to Occupied Japan. Ruby-Marie chose to decline the job to join her family on the adventure of a lifetime. The Lockridge family became the first dependents in Occupied Japan. While Ruby-Marie was in Japan she climbed Mount Fuji! She also met and married her first husband Captain Eugene B. Breeding. Ruby-Marie and Gene were married in Nagoya Japan when she was 19 years old. Soon after, Ruby and Gene were stationed back in the USA at Travis Air Force Base in California. It was there Ruby and Gene started their family. They had two children, Deborah Lynn Breeding and Larry Dean Breeding. Ruby-Marie was active wherever her husband was stationed. She became President of the Officers Wives Club. She also worked using her artistic talent to create illustrations for the government of the United States. As Ruby-Marie poured her love for life and creativity into her various roles and relationships, she developed a strong driving passion and pride for her family. Her love for family and others only multiplied when she accepted Jesus as her Savior at age 29. She got involved with the church and with Sunday school teaching, and made sure that her family was at church regularly. Ruby passed on her positive, encouraging spirit to her son and daughter. She never missed an opportunity to praise them and tell them how much she loved them. She and Gene instilled respect, integrity, and the desire to always "do your best" into them. She was "Mom" to most of Debbie and Larry's friends. She knew all of her neighbors by name and was at their door with a meal when needed. She held her children to a very high standard but at the same time embodied a forgiving spirit. She taught them to look for the best in everyone. Ruby’s husband, Gene, passed away in January of 1981, just before their first grandchild was born. The following year Ruby began to date a family friend, William C. Johnson and later that year they were married. From there her family grew once again. Ruby would have family and friends visit at her Orlando house or the Mountain House in North Carolina often. She would take cruises and trips all over the world, keeping alive her adventurous spirit and passion for life. When family was around, some of her favorite things were going to exciting places, seeing the sights, or experiencing new things. She loved to play card games of all kinds. This tradition lives on through her daughter, grandchildren and great grandchildren. Ruby, (Gramma, Gram, or Geeka) became a constant presence in all her grandchildren’s lives. She was at every birthday and event. As they grew, she was at every graduation, wedding, and great grandchild’s birth she could get to. She began a tradition of high school “senior year cruises.” She would generously help financially with honeymoons and other important life events for family and extended family. Ruby also passed on a musical heritage to her family. There was never a shortage of concerts, recitals, or church worship services for her to attend where her family was involved in the music. 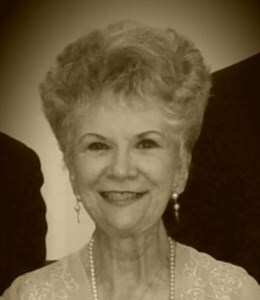 She loved to sing hymns, and the family would often gather together to play and sing hymns as an enjoyable pastime. Ruby was a strong and beautiful lady inside and out, a true gem. She lived her life with integrity, love and the warmth of hospitality. She was always thinking of others as more important than herself, and enjoyed every opportunity she had to give of what she had. She is famous for her big breakfasts, beautifully set dinner tables, and wonderful cooking. One of her favorite places to be was around a table full of family and friends, telling stories, sharing laughter, and there was always plenty of food! Ruby-Marie is survived by her daughter, Deborah Lynn Tomlinson and her husband Terry; a daughter-in-law, Kathy Davis and her husband, Glenn; her many grandchildren, Erin Lynn Tomlinson-Minard and her husband, Jim, Tiffany Lynn Tomlinson, Trevor Lynn Tomlinson, Micah Lynn Tomlinson, Jared Lynn Tomlinson, Lauren Grace Breeding-Ashmead and her husband, Shane, Kyle Breeding and his wife, Aimee, Kenton Breeding, Kevin Breeding and his wife Kayla, Dale Johnson and his wife, Carol, Wanda Cooley and her husband, Larry, Lloyd Johnson, Bradley Johnson and his wife Nicole, Leah Johnson, Mark Cooley and his wife, Cynthia, Amy McNeil and her husband, Bob, Brittney Johnson, and Shannon Johnson; a granddaughter-in-law, Linda Johnson; her numerous great-grandchildren, Audrey Lynn Minard, Eliza Jane Minard, Samuel James Minard, Bryson Pierce, Brayden Pierce, Maddox Breeding, Quinn Breeding, Luke Breeding, Zoe Breeding, Inara Johnson, Sariah Johnson, Addison Cooley, William Cooley, Carrie McNiel, Ethan McNeil; two brothers, Robert Lockridge and his wife, Lucia, and James Lockridge and his wife, Francie; and two sisters, Mary Dunagan and Beverly Maged, and her husband, Lee. She is preceded in death by her parents, her first husband, Eugene Buster Breeding; her second husband, William Clyde Johnson; her son, Larry Dean Breeding; and a sister, Barbara Mason and her husband John. Funeral Services will be held at First Baptist Church of Pine Castle, 1001 Hoffner Ave, Orlando, FL 32809, on Monday, September 10, 2018, with Pastor Bill Burkhalter, officiating. Visitation is at the church on Monday, from 10:00 am – 11:00 am. Interment will follow at Glen Haven Memorial Park, Winter Park, FL. To share your memories of Ruby-Marie or leave a special condolence message for her family, please click the Share Memories button above. You may also send contributions to the MOAACC (Military Officers Association of America, Cape Canaveral Chapter) Scholarship Fund at P.O. Box 254708, Patrick AFB, FL 32925-4708. Add your memories to the guest book of Ruby-Marie Johnson. Ruby was a kind, sweet, gracious lady. We miss her. We are so grateful we were able to visit with you this past July. You are so very loved and will be dearly missed by every9ne you’ve touched with your grace and love. I was so blessed to call you my Aunt Rummy and Frankie will never forget the encouraging words in that beautiful card you sent him during his traumatic fall. We love you and know that you are in heaven with wings! I remember, growing up, how excited I always was to go visit Gramma and Grandpa at the mountain house in North Carolina. There was everything a kid could want-- a downstairs area with wooden, rubber band guns and a tv, filled with beds for us cousins to sleep on. The whole house smelled of antiques and wood. Upstairs Gramma would always be cooking up a storm and laughing. She made so many jokes and hardly let any of us help her. We would always have a lovely meal, and occasionally depending on the holiday some kind of gingerbread competition. These holidays were always inevitably filled with hours and hours of card games. Old family feuds would come up as we played rummy, canasta, the works. I quickly learned that Gramma was the best partner and how to hold a poker face. Someone was always playing the piano. Looking back, I never saw her angry, stressed, or upset, even with kids running around wreaking havoc in her house. She radiated positivity and warmth. I never heard her say anything negative about anyone, either. It's only as I've gotten older that I've realized how rare these traits were in a person, and that she was the very base of the joyful atmosphere of these holidays. In the past 5-10 years, I've moved around so much, but somehow Gramma always found a way to send me a birthday and Christmas card. She knew how to make sure all her family knew that they were loved, near or far. My heart is filled with so much love for my Aunt Ruby! The last time I enjoyed an Aunt Ruby hug and smile was at my mom's funeral a little over 2 years ago...I cherish that memory, and her Facebook page picture was on that day...Glad we took that picture, family means so much to all of us! I will always smile at the memories of Aunt Ruby laughing and playing cards around mom's dining room table dressed in her beautiful colorful clothing, fun shoes, and jewelry! Incredible memories of Ruby. Her generous spirit will live on with us all who knew her. Her love of card games created a fun atmosphere where everyone was invited to participate. No one could set a prettier table for family gatherings. A tremendous privilege to be on the journey of life together for awhile. I am grateful for her kindness. Much love to all family members. You are in my thoughts and prayers.